Sir Terry Leahy explains in the Telegraph why he believes that the UK’s regional cities are being undersold and remain hidden in London’s shadow. He says that if we are to rebalance the economy then we need to get better at articulating our strengths and demonstrating the unique opportunities of doing business in British cities. He adds that most of the UK’s regional cities are well equipped with talent and capital but what are the missing is the boldness and belief to unlock potential and capitalise on the growth opportunity. Well yes, but in Liverpool/Merseyside the big problem is appalling political leadership with Labour Council Leaders at war with each other as to whom is going to be the local top dog. I saw it first hand when I was Leader of Sefton Council – then it was all about trying to unseat the Labour Chairman of Merseytravel. Now it’s a damaging row about which Labour Council Leader/Elected Mayor is going to be top dog. It’s gone on for years on Merseyside and Labour’s factionalism has been to the obvious gain of Greater Manchester just down the East Lancs Road/M62. Thanks for making a right old mess of things over there in the Liverpool City Region; we can’t tell you how much we appreciate it. Your squabbles mean more investment for us as Governments of any colour continue to laugh and despair in equal measure at your inability to get along with each other and construct a common front to take your City Region forward. We have benefited from your infighting over many years and now have a tram system second to none in England because the last Labour Government pulled the plug on funding for Merseytram as a consequence of your dysfunctional local government Merseyside family. Please keep up the good work; we are relying on you to continue to muck things up for Merseyside, despite Mr Heseltine trying to help you, so that Greater Manchester gets the investment that Governments will not give you. We are counting on you remember and thanks once again. The Leaders and residents of Greater Manchester. Oh how I wish this this was a political joke but sadly Labour continues to take Liverpool City Region in differing directions all at the same time. If Labour’s Merseyside bosses really think that taking legal action against each other will benefit the Liverpool City Region then I don’t know which planet they are living on! The Liverpool Echo has the story. Even I did not think things could get as bad as this despite my previous postings on the matter. The sad implication is that despite the disputes of past between Labour Leaders across Merseyside lessons have not been learned about why a united front to promote and back Greater Liverpool, or whatever you wish to call this sub-regional area, is vital. It’s as though because Greater Manchester is successful by being ‘united’ Merseyside refuses to united because it will look like we are copying the Mancs! The 6 Labour Leaders should hang their heads in shame; they have not represented us they have shunted us into a siding. As Cllr. Nigel Ashton said to me, ‘you couldn’t make this up’. The ill-fated Mersytram project, which the last Labour Government was having none of, was finally killed off in 2013 and we are told that investigations into it are ongoing as part of the wide ranging probes into Merseytravel generally. But the death of this project and the time and money wasted upon it leaves Liverpool and its commuter belt with unresolved public transport problems which will do harm to the local economy by holding it back. 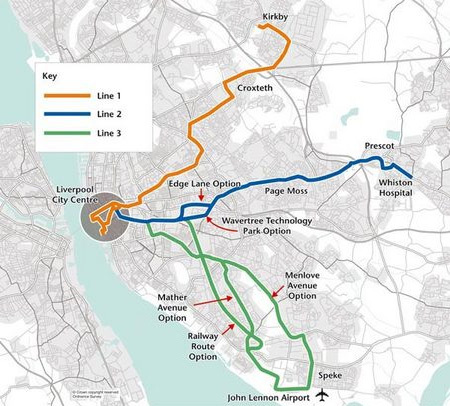 In my view the big transport issues in the Liverpool City Region are resolvable via investment in the already established and highly successful heavy rail system that serves the City and some of its commuter belt. * The Northern Line which presently terminates at Ormskirk needs to extended first to Burscough and then ultimately to Preston. * The Northern Line route to Kirkby needs to extended through to Wigan, with a potential spur into Skelmersedale. 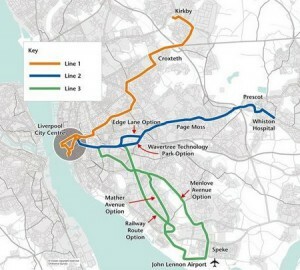 * Liverpool Airport needs to be rail connected to Liverpool South Parkway Station or a connecting tram from that railway station needs to be built to the airport. * The Bidston to Wrexham line. * The Southport to Wigan line. The Burscough Curves need to be reconnected so that Southport to Preston and Southport to Ormskirk rail journeys are again possible. To me these objectives are straight forward but on Merseyside the obvious got muddled into what may have been seen as a competition with other major cities to get a tram system established. Yes, trams were then the new fashion and Liverpool’s great rival Manchester along with cities like Nottingham and Sheffield have had great success in establishing and then extending new tram lines. But, was it right to propose trams for Liverpool when it already had a highly successful heavy rail electrified system in place? I think the planning in the 1990’s and early 2000’s was wrong and Liverpool ended up following the fashionable route towards trams instead of doing the obvious and developing what it had already started in the 1970’s when the heavy rail systems were brought together via the underground tunnels. In some ways the tram plan was also too insular as it did not address the need to easily get people people into the City from a commuter belt that stretches well beyond the rather odd Merseyside boundaries. It was a plan to better move around the present population of a small city rather than a plan to spread Liverpool’s wings into its wast commuter belt in Lancashire and Cheshire. And the lessons for this are all to clear from Greater Manchester where public transport developments have been logical and well supported by Governments of all colours. It may be hard to learn from an arch rival city but the fact is that Manchester has played its transportation cards well and Liverpool needs to learn from that. Merseyside’s big advantage is its network of heavy rail electrified lines. They simply need to be developed so please lets get on with it.